NEW YORK (WABC) -- It happens to me every time there's now a mass crisis. I feel a flashback. It's a numbing and horrifying feeling. Right back to THAT day. And it matters not the type of mass-scale incident. It happens to me. A shooting at a school or a job site. The devastating flooding of Houston. The mass evacuations right now in Florida and the carnage of Hurricane Irma right now. And, always, during a terror attack. Each of them. All of them. The deja vu feeling is immediate, as if turmoil and chaos and despair are the new normal. It's followed by a big mental sigh: I will feel this forever; I will never get over it. And then a second sigh: This is as it should be -- I should never forget THAT day. And then my immediate flashbacks are suddenly eased. Slightly. And then the third sigh: This is now our way of life, and I have to compartmentalize these feelings because, after all, I have a reporting job to do. I know I'm not alone, although the more time that passes since the 9/11 terror attacks, the more people there are who didn't experience firsthand the raw fear and anger and thick mental fog that followed the attacks by radical Islamist terrorists who hijacked four planes and wreaked havoc in Lower Manhattan and at the Pentagon and in a field in rural Pennsylvania; the terrorists from al-Qaeda who spread fear across this country and around the world, changing the way we go about our daily routines, perhaps forever. 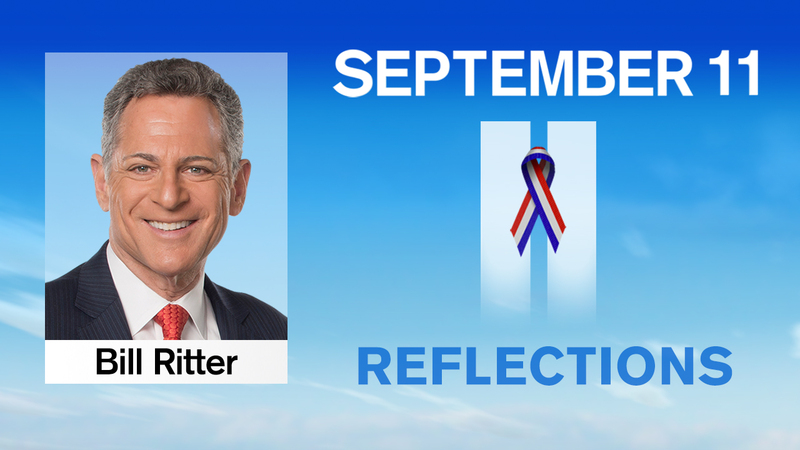 The 16th anniversary of the 9/11 attacks - it seems like yesterday, it seems like forever - has, for most of us, a different feeling of grief and sorrow than the early anniversaries. It is not as immediate, there is the distance that comes with the passage of time. Unless you are a family member of one of the victims - and for them there is less of a distance, if there's a distance at all. We will again cover the reading of the names of those who were killed in the attacks on the World Trade Center towers, the area that would soon after be known as Ground Zero, the area that has now been reborn, with office buildings, a huge new tower (the biggest in the country), and a powerful memorial and museum. It is a solemn and emotional memorial event. It always is. We mourn, still, for all those who were killed. We remember, still, where we were when it happened, what we were doing, what we were thinking, what we were feeling. And how we felt afterwards. I was getting ready to go to the gym on that Tuesday morning back in 2001. It was a bright, crystal-clear blue sky; the first week of school for my kids. Spirits were high. Our 6 p.m. producer, Zahir Sachedina, called me at home. "You watching what's going on?" The emotions 16 years later are, I know, right on the surface. It doesn't take much to bring them up; writing these words is enough to do that. The other is a "stand up" on tape by NJ Burkett. A burning tower was over his shoulder as he looked into the camera and talked about what was happening at that moment in Lower Manhattan. His cameraman suggested he do it again - another take. He did...and as he spoke, the ground rumbled and there, over his shoulder, the first tower crumbled. N.J. looked back, and then, like everyone else around him, started to run. N.J. for many years didn't participate in our annual remembrance coverage of the 9/11 attacks. The pain, the memories, the scars - all too fresh. But he will once again this year bring his unique reporting skills to our coverage. And I am grateful for that. But, with N.J. as an example, we know that the anger and sorrow are, for many, still part of their lives. It is easy to talk about closure - but I simply do not believe there is such a thing. The wounds can scar over, but there is no closure for a wife who no longer has her husband, or for parents whose child was killed, or for a child whose mother perished that day. But the people who died that day aren't lost. They were killed. And to say "lost" is, I think, to sugarcoat the reality. It's harsh what happened, and we should acknowledge the harshness. They were killed. They died. They weren't lost. We know what happened to them. I was there to cover the attacks and catastrophe that followed. And I've been there for the memorials. And I will be there for the 16th anniversary. It's my honor and privilege to participate.